So Lia waited for the right opportunity to get by Christopher. Kirk Alexander was disappointed that he wasn’t able to finish out the race. With $10,000 on the line, racing is bound to be exciting. Donny Lia and the 18 team showed that a combination of smart racing, patience, and speed were how to get the job done Wednesday night. The battle was between Lia and rival Ted Christopher in the closing laps of the Vivieros Insurance Modified Madness 100 at Seekonk Speedway on July 20. Lia went home with the victory, the paycheck, and the trophy, but the excitement at Seekonk began long before the checkered flag waved. 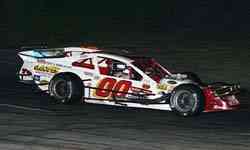 Eric Beers had the car to beat from the start. He led ¾ of the race, battling with Ted Christopher in the beginning. But TC just couldn’t get around him. Meanwhile, Kirk Alexander in the 43 was racing Jimmy Kuhn in the 72 for the third spot. Alexander finally got by Kuhn around lap 31 and soon went on to take second spot. The real action came around lap 77. Alexander was starting to run down Beers and they started to catch up to lapped traffic. After leading most of the race, Beers ran into trouble. 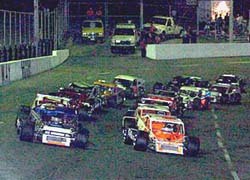 There was a full field of Mods on hand at Seekonk. Lia credits his Crew Chief Kevin Crowley with helping him run a smart race. It wasn’t a tour race, but Lia is looking forward to this weekend “We’ll have a good race car,” he said. April Barker is the producer and on-air host of Weekend Thunder, a radio show that airs on Boston's only NASCAR station AM 1510. Click here for more information. But the obviously disappointed Alexander still sounded optimistic about the future. “The car was fast though…just wait,” he said. TC wasn’t expecting to get back up to the front, but when Beers and Alexander tangled it put him back in position to fight for the win. But Christopher’s car became too tight to hold off Donny Lia. Just as Lia got the lead at about lap 98 there was a wreck on the backstretch that brought out the yellow flag. 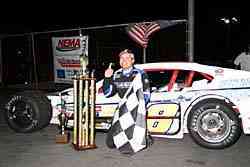 He was able to hold off TC on the green-white-checkered restart and took home the win. How close was the racing? Well, can you even see the #18 of Donny Lia on the inside racing with Ted Christopher in the #00?